Michael Pompeo, this former tankman and congressman from Kansas, the state having the nickname "Sunflower State", whose inhabitants really feel that the rest of the world's countries are somewhere on the Moon. Ex-director of the CIA, and now the candidate for the post of head of the US State Department personifies everything for what the world so does not like America and Americans. Therefore, what happened at the Senate hearings of the US Congress can not be a surprise for us. 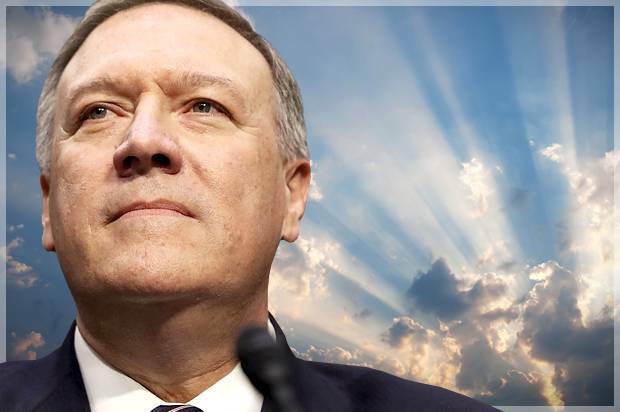 We should even be grateful to Pompeo for being frank, so that those who have not yet understood this, get rid of all illusions that you can get along with America. This is possible only in one case, if Russia surrenders and disappears. Pompeo told the senators that the United States is "a unique, exceptional country, Russia is unique, but not exceptional," and will, therefore, be punished for not being like everyone else. In other words, he said that the US should authorize the policies of other countries, even such as Russia. Without a "label" from Washington, no one and nothing has any right. On Pompeo's deep conviction, the foreign policy of any country, if it is not approved by Washington, is "aggression", and to allow such, therefore, to show weakness. "The current administration also announced a review of the nuclear strategy ... A few weeks ago, the Russians met with an equal opponent, and a couple of hundred Russians were killed ..." - again boasted Pompeo. And this passage is very characteristic: the future head of the State Department has publicly demonstrated to everyone that he is a liar. As you know, not a lot of Russians died in Syria during the attack, not even dozens. In addition, it was not at all a battle with an equal opponent, since the Americans struck from a long distance, in which the killers did not take any risk. The future head of US diplomacy pointed out that Washington would incite other countries against Russia by equipping "brave men and women" in Ukraine and in Georgia to "resist Russian expansionism." Pompeo gave, in fact, thereby understand that no Minsk agreements will work, that blood will continue to flow in the Donbass. Surrounding Russia with hotbeds of tension and conflict is what the future head of the State Department wants. And in addition to all, Pompeo still accuses Russia of "interfering in the American elections." This statement promptly commented on the Russian embassy in the US: Russia "does not deal with regime changes, interference in the internal affairs of other states, but the US has" rich experience "in such matters," a list of their "merits" and examples of "bad behavior" around the world impressive. " With reference to US data and testimonies from former US officials and employees, Washington intervened about 80 times in 45 countries. Of course, in Russia, Ukraine, but also in Albania, Argentina, Brazil, Bulgaria, Britain, Haiti, Guyana, Guatemala, Greece, Dominican Republic, Indonesia, Iceland, Iran, Costa Rica, Cambodia, Laos, Lebanon, Malaysia Mauritius, Malta, Nepal, Nicaragua, Panama, Peru, Romania, San Marino, Slovakia, Somalia, Thailand, Uruguay, Chile, Sri Lanka and Jamaica and other countries. An impressive list, but it does not in the least prevent Pompeo of accusing Moscow of "undermining democracy" in the West. In general, it turns out that Russia "undermines Western democracies" and "promotes its candidates" in foreign elections, while the US is engaged in "promoting democracy and human rights." The Americans are white and fluffy, the Russians are cunning and evil. It will be very difficult for Russian diplomats to talk to such a counterpart. And will it even make any sense? Americans do not consider Russians to be equal to themselves and quite sincerely believe that they are not required to comply with any formal arrangements.